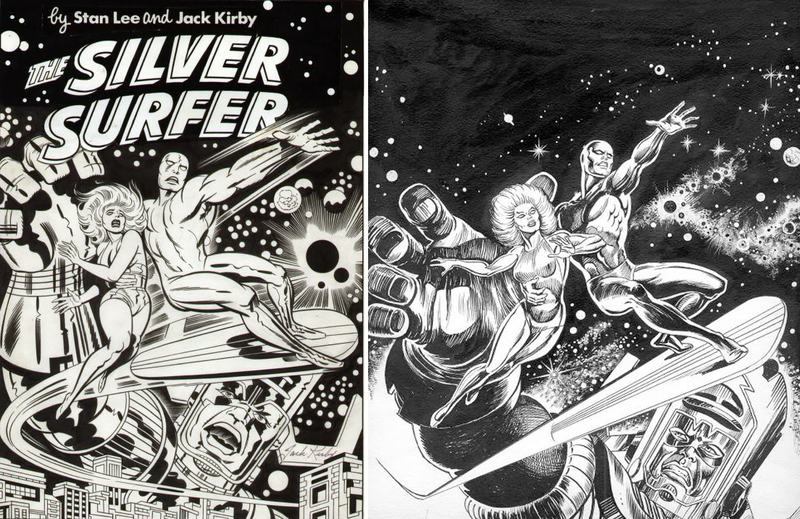 Not one to find a picture of the Silver Surfer I didn't like, I remembered seeing Jack Kirby's take on the same shot, and have to say I think Norem schooled 'The King' on a few points. While no one draws space like Kirby, and 95% of the composition is his genius, Norem's mastery of anatomy really shines out. Nova seams more fluid although not so terrified, and the Surfer seams more comfortably placed. Nova's shadow also gives his body more weight. Galactus will always look better drawn by 'The King', the costume is his signature style at it's best, but Jack also scores for placing the buildings at the base of the image to highlight the devourer's scale, which were later added back to Norem's piece in the final product. They also changed the Surfers flightpath back to encircling ol' purple boots too, personally I like the line Earl was taking on that one. But enough from me; two takes, same image. Whose do you prefer? That is great,kinda reminds me of Joe Jusko's work which is high praise I assure you. Norem did an especially nice job of creating even more movement in the scene then Kirby's original which also says a lot. Another great find Dan! Can't I just have both? Randomnerd - of course you can have both It's A Dan's World remember! 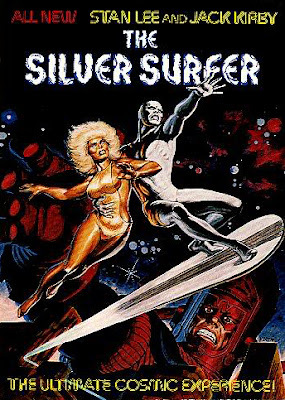 Like I said in the post I never met a Silver Surfer image I didn't like either. Plus is it me or in Earl's work does Nova look allot like Tina Turner? David - Joe Jusko is amazing praise - I am a huge fan of his work and some of my favourite IADW moments are the times he's dropped in to comment and clicked 'follow' on my blog (He's one of the first followers when you scroll back in the sidebar list). The fact someone you use as artistic inspiration can drop in and appreciate your work in any way in kind, is just more mind-blowing than words can allow. YES! Tina Turner! That's the name I was looking for. Thank you. That was bugging me all night. Norem's is the one I want to hang on the wall by my bed. Kirby's is the one I want on the cover of my comic book. Just to clarify. That's pretty much my breakdown too come to think of it! Glad I wasn't alone with the Turner reference either. I thought it was a good chance as it was done in the 80's when Ms Turner was beyond Thunderdome. I remember when I first saw pics of Tina from Thunderdome I thought of Storm. I have to go with Kirby, I'm a Kirby slave...but I like the look of the Norem, it's really got the late seventies/early eighties feel to it. Nice post I had never seen either the Kirby or Norem outlines before. Just a quick note, the female character isn't Nova it's a cosmic powered clone of Shalla-bal called Ardina. This story is set in the Earth M universe directly before the events in Stan Lee and Moebius' Parable. There is no Nova becuase there is no Fantastic Four on Earth M.
Hey Rue - thanks for dropping by and commenting! The fact it isn't Nova gives reason wht she looks a bit more realisticaly figured I guess - and all makes more sense now. Cheers!